Joan Benoit, a Bowdoin College senior from Brunswick, Maine, is crowned winner April 16, 1979 of the women's division of the Boston Marathon by Will Cloney director of the marathon. At left, is Katherine White, wife of Boston's mayor Kevin White. 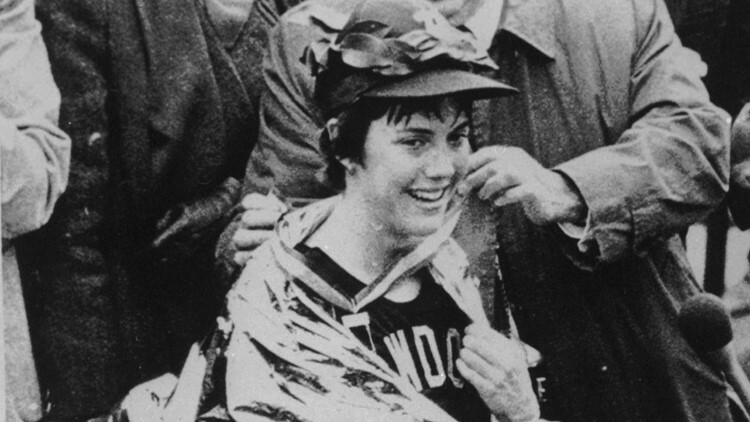 Joan Benoit set a women's record in 2 hours, 35 minutes, 15 seconds. The Maine native will toe the line alongside more than 30,000 runners for the 123rd Boston Marathon. BOSTON — Joan Benoit Samuelson has been writing her story stride by stride for 40 years. “I've challenged myself with storytelling,’ Samuelson said. “There’s nothing like going out on a limb." Now at 61-years-old, she plans to write another chapter by running in the Boston Marathon to celebrate the anniversary of her record-setting victory in 1979. The Maine running legend ran a course record to win the 83rd Boston Marathon in 1979. Wearing her Polar Bears singlet and a Red Sox hat, she ran from Hopkinton, Massachusetts, to Boston's Boylston Street in a women's division-winning time of 2 hours, 35 minutes, 15 seconds. This time she plans to come within 40 minutes of that time. Samuelson would win the 1983 Boston Marathon and set another world record, before going on to win Olympic gold and gaining worldwide fame in 1984. Samuelson will join 170 other Mainers in Monday’s race. That is why she founded the now iconic TD Beach To Beacon 10K in Cape Elizabeth to bring people from all over the world together with amateur runners in Maine. "We're getting close to the final chapters,” she said. Samuelson will be wearing bib 1979 in honor of her first victory.